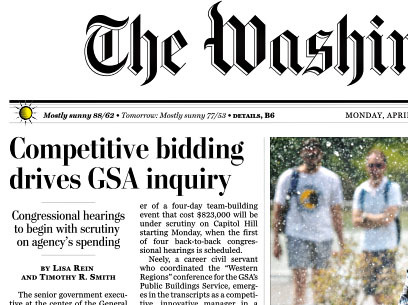 Neely’s conduct as the organizer of a four-day team-building event that cost $823,000 will be under scrutiny on Capitol Hill starting Monday, when the first of four back-to-back congressional hearings is scheduled. …. Transcripts provide evidence of a freewheeling spending culture in the offices of the four Pacific Rim states where Neely oversaw federal real estate and government purchasing. “What this guy did was try to use private business practices to justify spending that is out of line with the private sector,” said Sen. Claire McCaskill (D-Mo. ), one of numerous lawmakers asking how things spun out of control with no oversight from Washington. I suppose Neely deserves his chance to be publicly tarred and feathered on front pages around the country, but I wonder if I’m the only one who wishes Congress could summon up this same level of energy for things that actually matter. You know, global warming, drug policy, immigration rules, stuff like that. I enjoy a feeding frenzy as much as the next guy, but I feel a little sated lately. If Congress spent half the time on actual serious issues that it’s spent on nonsense like Solyndra and Fast & Furious and the GSA and — starting soon I’m sure — Secret Service agents and their Colombian hookers, we might actually solve a problem or two. You never know.